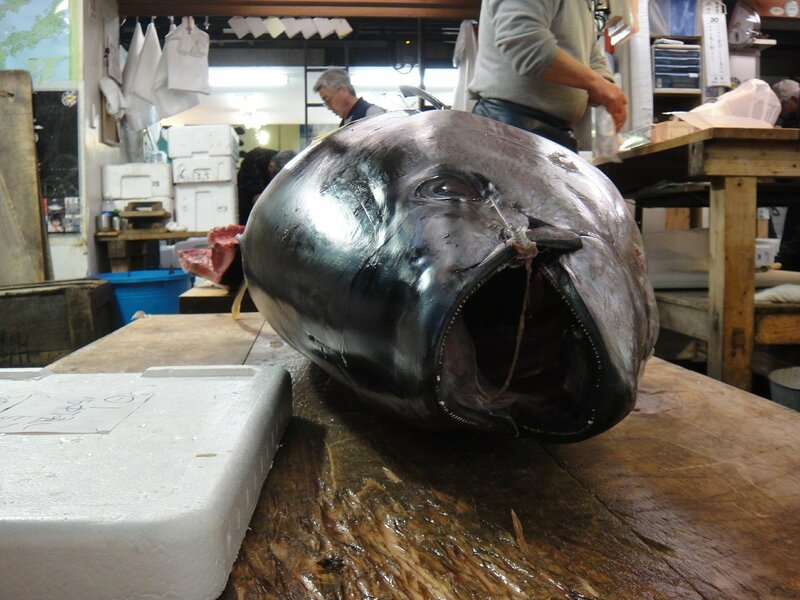 Around 9 o’clock in the evening tuna from around the globe starts to arrive in Tsukiji. About 3000 tuna are sold here every day. More than 75% of tuna that passes through Tsukiji is frozen, caught in distant oceans such as the coast of Ireland or near the Maldives. Fresh tuna caught in the seas around Japan are packed individually in wooden boxes. Some of them are selling for at least 1,5 million yen each. Tuna is one of the most popular kind of fish in sushi restaurants. 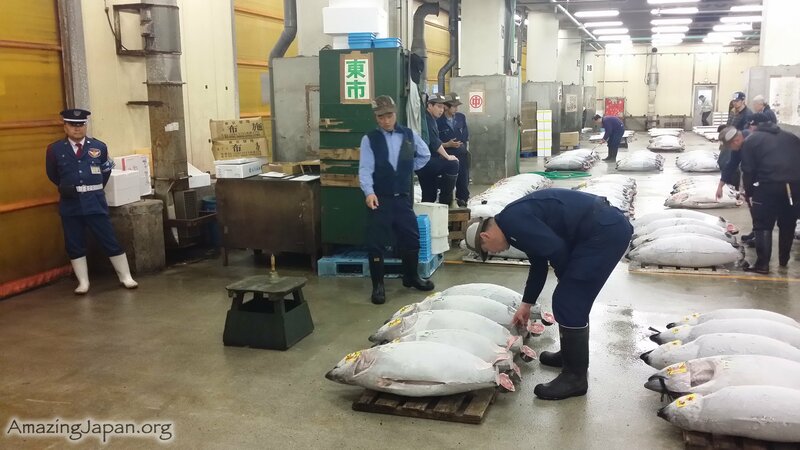 At 4:30 a.m. Tsukiji is crowded with buyers gathering inside the tuna auction hall. Tunas have been laid out in rows and before the auction begins buyers inspect the fish. They examine each one closely to determine the quality of its flesh, because tuna and other fish are often eaten raw in Japan. The highest quality is essential. Each of the tuna have its tail chopped of. By inspecting the flesh that is revealed buyers can get a good idea of the overall quality. Buyers take a piece of the flesh and roll it between their fingers. Based on the oiliness and the color they can check the fat content which determines how good it will taste. They also check other aspects such as the texture of the fish and the curve of its bell. To understand quality of a tuna before its sliced open its a great skill. It takes at least 10 years of experience to be able to judge a tuna this way. At 5:30 a.m auction begins. The wholesalers bid for individual fish they have inspected. It takes just five seconds to auction each tuna. The buyers convey their bids using special finger gestures called Teyari which stands for numbers. Once a buyer is successful the tuna is loaded onto a cart and rushed to the wholesalers market store so that it can be sold while it’s as fresh as possible. The next step is to cut the fish to the size of portions that the customers require. At 7:00 a.m. the customers start to arrive. Many of them are from fish shops or restaurants. The price for each transaction is decided between the market wholesalers and their customers. It’s a form of haggling, there are no written prices posted. To ensure they get the best cuts of tuna for the best price the retail customers also need to have a keen eye for quality. 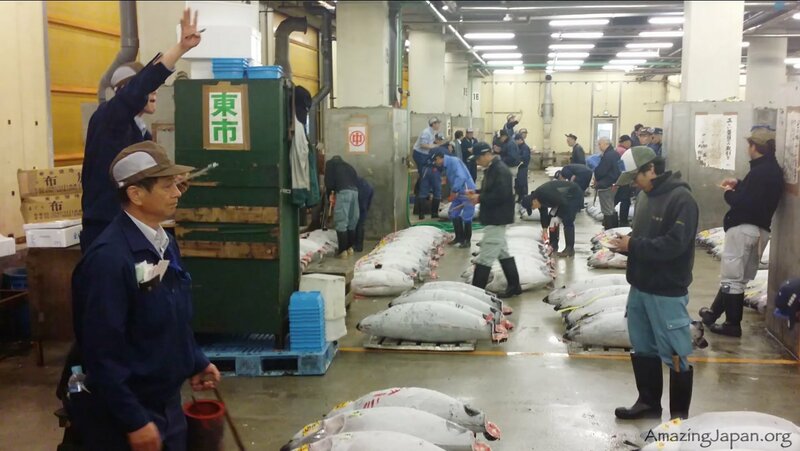 Tuna auctions are very popular among tourists, only 120 people each day may see it. To take the queue you had to come at night, around 2 a.m. But this auction are just going down in history. 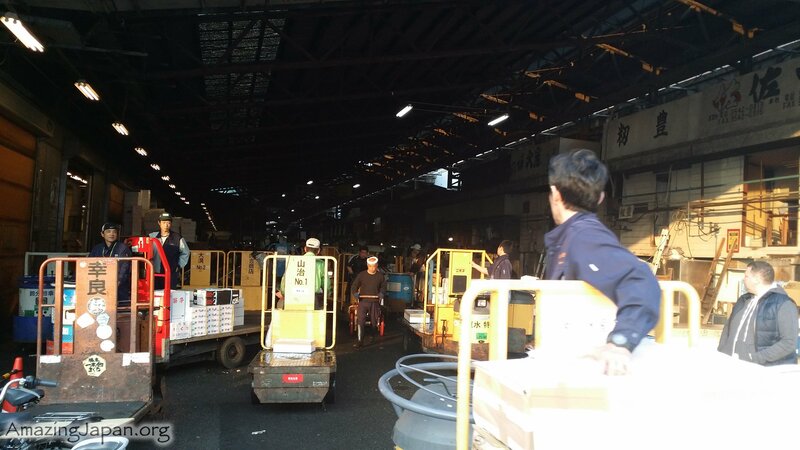 After moving the inner Tsukiji market to Toyosu market, there will be no longer public auctions. 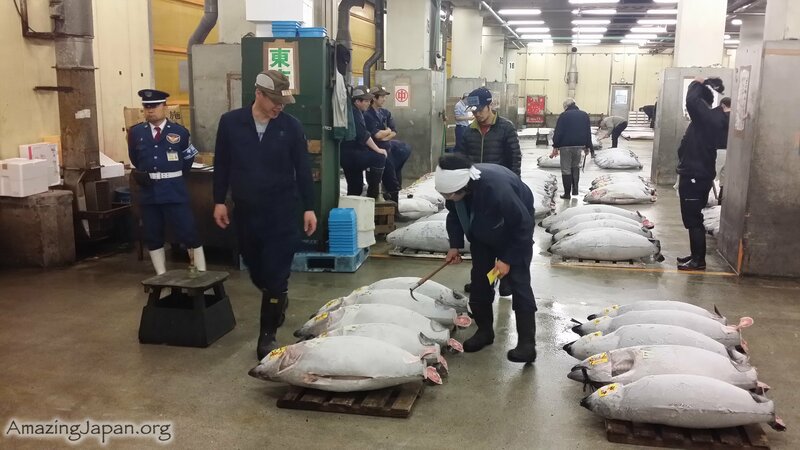 Today, September 15, was the last public auction of tuna.